Apple Podcasts – Apple’s Podcasts app is great for people just getting started with podcasts, people who still like to use iTunes to manage/play their audio files, and people who just want a basic, simple — and free — Podcast player. One thing that’s really nice about Apple Podcasts — especially for beginners — is that you can use iTunes on a desktop to (more easily) search for podcasts to try, and then just enable the setting on the mobile Podcasts app to automatically sync up those subscriptions/settings via the cloud. If you only have a few podcasts you want to subscribe to, you intend to listen to most every episode, and you don’t have a preference of “streaming” over “downloading,” then Podcasts might be the only app you’ll need. Overcast – Truth be told, this is my podcast app of choice, but there’s a bug that seems to only affect me and a couple other people that has led me to trying other apps. Chances are this bug won’t affect you, though, so I highly suggest giving it a try. This app is great for people who don’t have large/unlimited data plans, as you can easily set it up to download new episodes in the background only when you’re on wi-fi. (The current version doesn’t even support streaming, which can be a data hog if not managed properly.) Overcast features some intelligent playback functions that the competition lacks — like a feature that speeds up playback simply by cutting out gaps of silence, i.e. without making people talk faster. It’s also got a great user interface, and a nice, visual way to search for new podcasts. I’ve also found Overcast to be especially friendly to people who like to subscribe to a lot of podcasts, but don’t want to listen to every episode of them. What really makes Overcast stand-out though is its design. The app is designed for speed and ease of use, eliminating any features/menus that’d add more complexity than functionality. In many ways, the uncluttered app is more “Apple” than Apple’s own app. If Overcast still offers a free-to-try version when you read this, I’d recommend doing that. Downcast – This is for the podcast super-users out there. Downcast is so feature-rich, it can be overwhelming for a lot of people, not to mention clunky to navigate. The user interface is definitely on the overly-complex side of things, but that’s only because it truly offers every possible customization under the sun. iCatcher! – This is the current app for me. I didn’t try it until recently and regret not trying it sooner. I’d still love to go back to Overcast some day as that app really does feel like it was designed just for me, but until then, iCatcher gives me the exact experience I want: Once it’s set-up, I barely have to touch it. In terms of functionality, iCatcher! is about on par with Pocket Casts (i.e. somewhere between the stream-lined Overcast and cumbersome Downcast), but the app eschews Pocket Casts’ “Up Next” cue for playlists with the option for continuous playback baked into them (which in my mind is how it should be). That means I can go days without ever tinkering with the app, other than to hit the play button. For the few podcasts I like but don’t love, it’s easy to pick and choose just the episodes I want to download and listen to later without having to go through too many menus. 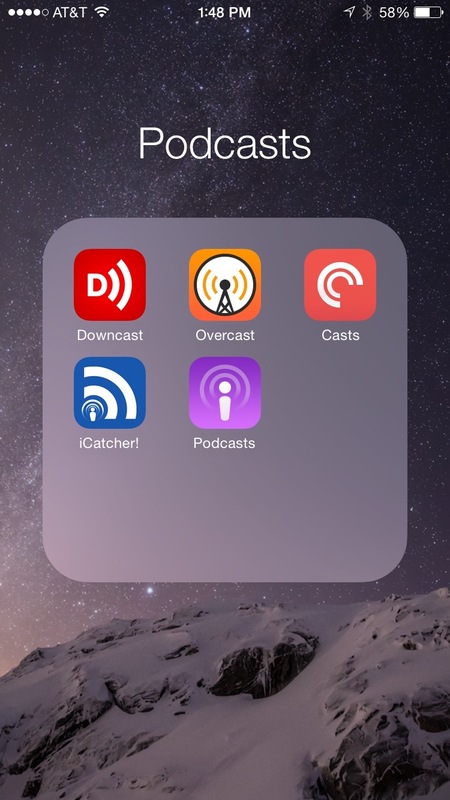 Pocket Casts, Downcast, iCatcher!, and the full-version of Overcast all cost a few bucks ($3 to $5 at the time of this writing). I’ve bought and tried them all before settling on the one I like the most, and I don’t mind doing so at all. All the developers earned every penny, even if I didn’t wind up making their app my default app of choice. What’s your app of choice? UPDATE 3/22/16: In the many months since I first wrote this, Overcast has released a couple big updates. The first major update — to 2.0 — fixed the issue I had with the playlist order resetting itself. The next big update — to 2.5 — further fleshed out a lot of features missing from the original release (like streaming). I highly recommend it for both people with simple podcast playing needs and now for those with more complex needs, too. It’s a greater podcast app to start with, and I feel list most people won’t even realize they need something else.